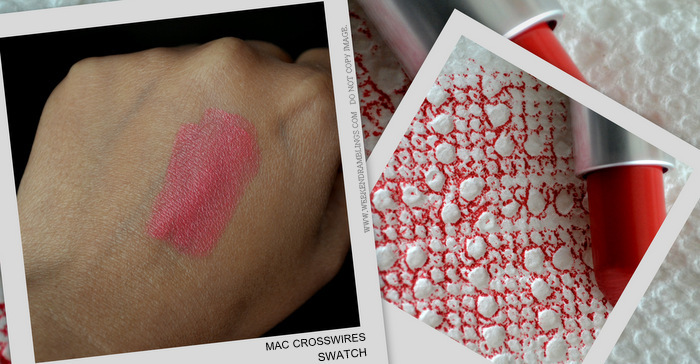 MAC Crosswires is an opaque pink-coral color that goes on with a creamy sheen and is quite gentle on the lips. The lipstick has the signature MAC vanilla scent to it. I have read reviews mentioning a hint of a shimmer in it, but it's not something I have noticed so far... The lipstick looks reddish in my photos - am still adjusting to the newer lighting - but in real life, the color in the tube is a slightly less intense pinkish coral. In the photo, I have applied the lipstick directly to get a perfect opaque finish. Most times, though, since I prefer a sheerer finish, I apply it with a lip brush which does tone down the brightness a bit - or topped with a gloss to soften the colour while still retaining the brightness. I get about 3 to 4 hours of staying power with this lipstick, and it doesn't settle into lines or dry out my lips. MAC Crosswires is perfect for bright summer days when all I want to do is get ready in a jiffy and spend the day eating ice creams :D A beautiful coral-pink color that is sure to brighten the face and the mood, Crosswires is definitely one of the must-have colors from MAC. Great color but true that it is too bright for our skin tone! Oh you should definitely get this (..and So Chaud too, probably)...it would look beautiful on you! Hehheee...you cuckoo crazy :D :D :D Thankoo..you try this na when you go anywhere near a MAC counter..am sure you will LOVE it! ah...I'm going crazy over Crosswires now...have to have it! This kind of colour seems to highlight complexion imperfections. A MAC artist doing my sister's wedding make-up used it on her and it looked awesome though, but of course she did her foundation perfectly too.